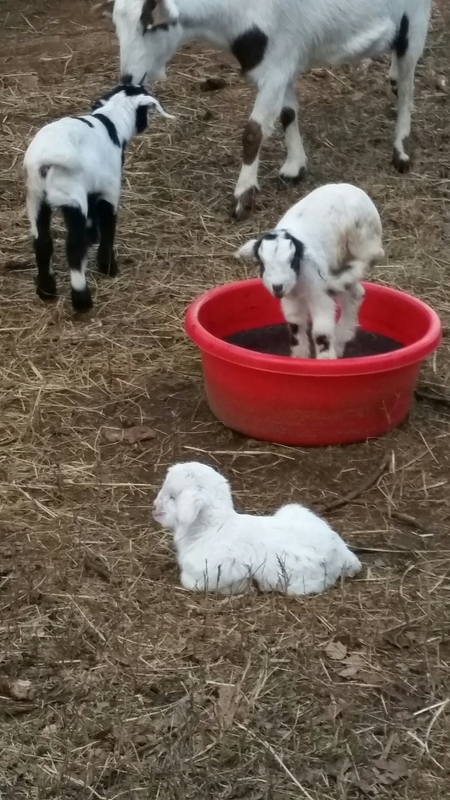 Oddly enough, when you have multiple goats giving birth around the same time, the mothers seem a little more relaxed than when just one kids.In December, when ZsaZsa-Noel was born, her mother Connie Francis seemed nervous. She was a first-time mother and it was cold. Now, Rita Rudner and Vera Wang are first-timers, and they recently established a babysitting schedule with Faith Hill. I’m not sure how they determine whose turn it is, but they care for each other’s kids with more love and affection than some humans. 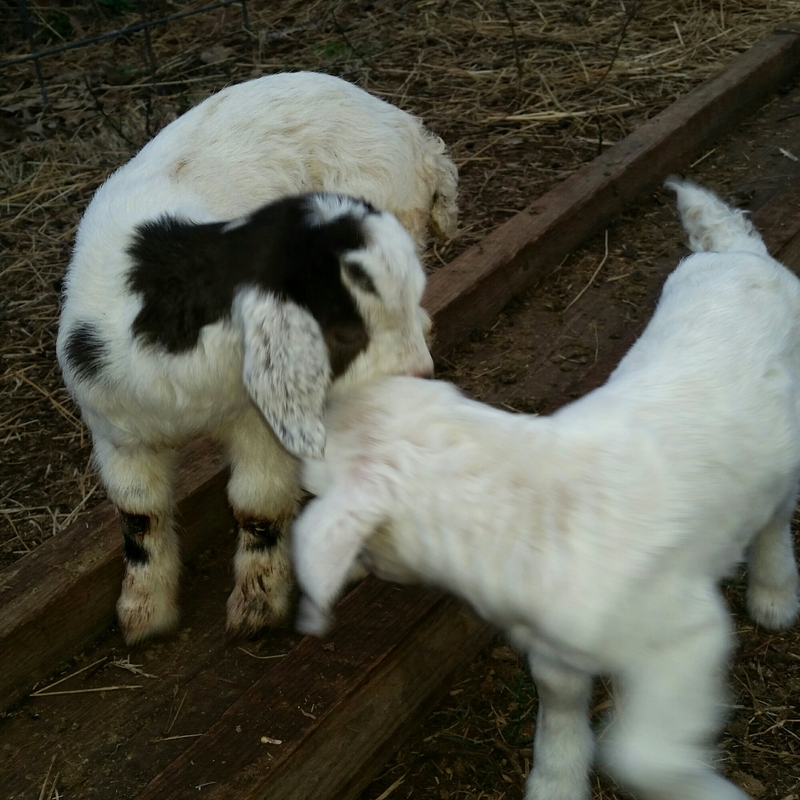 Our goats have a routine of browsing the pasture, and one part is farther from the stable than week-old babies can travel. In the morning, Faith Hill stays at the barn with the kids while the rest of the herd, including ZsaZsa-Noel, migrate to the lower pasture. 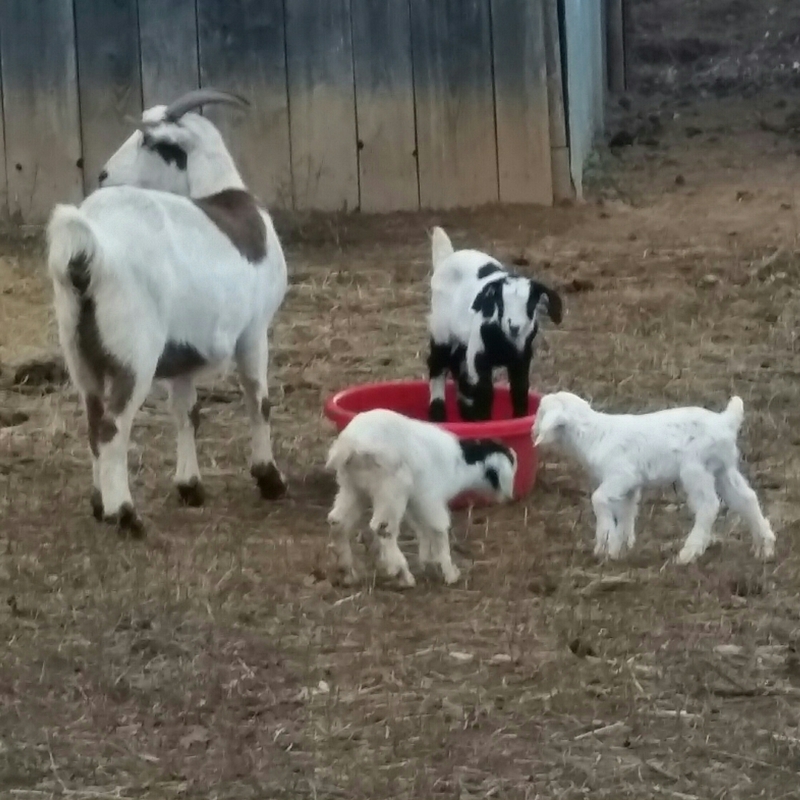 Later, Rita Rudner watches over the kids while the herd browses. All the while, the donkeys split their attention between the herd. Rita makes small noises to indicate she is nearby and as the herd walks back to the barn, Vera Wang and Faith Hill call to their does for a snack. Julie Andrews’ newest arrivals changed the routine a bit with Julie staying in the woods to hide Ernie. Bert has been staying inside the house with us at night, sleeping in a laundry basket beside the bed. Scooby noses him and is overjoyed to see me bring him to the house each night. At midnight and 3 am, I take Scooby and Bert outside to potty. Then, it’s and 5 am feeding and he’s returned to the herd at 7 am so that I can go to work. Bert and Ernie don’t venture far from the barn, but hopefully that will change once Bert gains more strength in his back legs. When Betty White kids in a few weeks, hopefully, her baby will be added to the daycare roster without much fuss. Already, Mae West, Texas Guinan and Clara are the best of friends. They bounce, run and snuggle with each other. Yes, I know, they’re goats. And they give a glimpse into the herd mentality and group dynamics for anyone interested.